Private Waterfront Cottage. Private Dock. Waterfront Pool Access. Easy Walk to the Beach. This picture perfect Bayfront private house is ready to surround you in comfort. Walk through the beautifully landscaped yard and into the front door of this private residence and you will find yourself in another world. Just a few minutes walk to the sugary sand of Madeira Beach and the Gulf of Mexico and close to fantastic restaurants and activities, this all renovated waterfront home captures the true essence of waterfront living in Tampa. With tropical landscape and serine views of Boca Ciega Bay, this is an ideal vacation spot for combining outdoor activity with luxury accommodations. Marble flooring, granite counter tops, gourmet kitchen and a scenic dining area will make evening meals a pleasure. 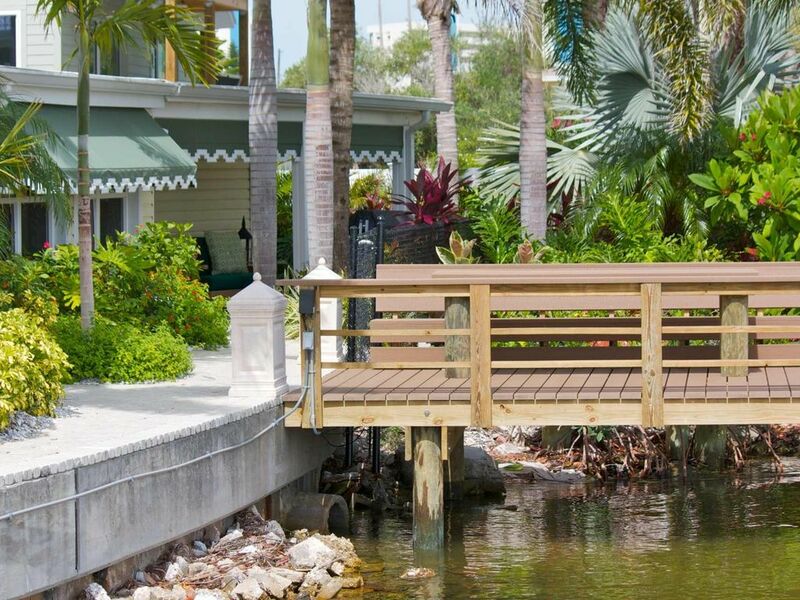 Walk out to the deep water dock and search for dolphins nearby. Grill outside and dine on the dock for a sunset delight. Inside you'll be pampered with designer furniture and decorations throughout, a beautiful King size bed in the master bedroom, two twin size beds in the second bedroom (converts into a second King Size bed if desired), and an amazingly comfortable full size pullout couch. We provide the finest of towels and linens, and you'll find everything you would ever need in the fully stocked kitchen. All new washer and dryer for your private use, free high-speed internet WiFi service, big flat screen TV with cable and DVD player, private covered patio and best of all, true peace and quiet. ** As a special amenity, the waterfront pool at the NEIGHBORING house is available for our Guest's use (please note, the pool is not heated but stays very comfortable during the summer months). Nearby activities include sailing, kayaking, biking, shopping, parasailing, jet skiing, boat rentals, shopping, or fine dining. If you're more of a sports fan, catch a game with the Tampa Bay Buccaneers, Tampa Bay Lightning, Tampa Bay Rays, or one of the many teams that visit the area for Spring Training. Visit world-class museums, exciting concerts, or historic Florida landmarks. There's always something to do. Perfect and quiet place to get away. Very clean, updated home with almost everything you would need. Will definitely stay here again. We spent 10 days in this cozy two bedroom hideaway. Located on the inner coastal waterway this well appointed home has everything a family of four adults and one two year old could ask for. Interior finishes were top drawer with updated appliances, granite counters, luxurious tile floors, full window coverings, crown mouldings, and tasteful decor. Location is everything. We were a six minute walk to two beach accesses. The home was outfitted with a bare minimum of housekeeping items but adequate. I would recommend taking a variety of cooking spices as there are none supplied. Coffee on the dock was amazing. Dolpins could be seen at most times during the day. At one siting we could hear them surfacing and blowing. The foliage was so profuse it gave lots of protection while relaxing in the patio area. Bicycles were located beside the garage. Fishing poles were there as well. All good to this point. The pool area was stunning to look at. A hot tub and waterfall feature to the elongated pool located behind the owners home was surrounded by rock features and lush landscaping and paver stone walkways. Nice. However, no heat in the hot tub or pool. At 68 degrees difficult to enjoy the water. The walkway was not user friendly as it was quite narrow between the docks and the pool area. Ok for adults, not so much for a two year old. Parking allowed one vehicle in the driveway. The garage was locked with no access. A short drive to John's Pass, groceries, Candy Kitchen (this is a must do), bars, eateries, mini-golf, shopping, spring training baseball, and the Valspar Championship. Would I recommend staying here a second time? Absolutely!! We enjoyed our stay at Boca Ciega Cottage. It was very nicely decorated and very clean. The location was great with a great view of the harbor to watch sunrises and just a short walk to beach. The pictures were true. We would visit again! The cottage is adorable. We found it to be nicely appointed, clean, welcoming and comfortable. We didn't take advantage of the pool on the neighboring property but it was beautiful. We would have definitely used the hot-tub had it been heated (unfortunately, that isn't part of the amenities). Also, make note the kitchen is well stocked with dishes and utensils however, there are no condiments available (not even salt/pepper), so bring what you need if you plan to cook. I would also bring or request housekeeping to leave a couple of extra bath towels. There were plenty of hand towels but only 2 full size bath towels for our use during our 3 day stay. The waterfront location is beautiful and so relaxing. Close to the beach and lots of good restaurants. We visited John's Pass and had a wonderful meal at the Friendly Fisherman.....highly recommend! Also, had a great breakfast at Doe Doe's. We would definitely return to the cottage when in the area again. Liz with I-trip was easy to work with and prompt in responding as needed.